GM unveiled the third variant of their new Kappa small rear-drive chassis at the Geneva auto show...or did they? 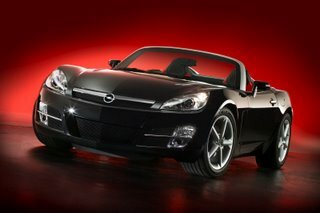 Since Opel and Saturn are now closely linked, it should come as no surprise that the Opel GT (a name we haven't seen since the 70's 2-seat coupe that Opel once sold in the the US) is little more than a Saturn Sky. Only this time with the Solstice GXP's turbo 2.0l Ecotec 4-cylinder (making this a twin to the Saturn Sky Redline - which GM will likely officially announce at the New York autoshow in April). Opel GT prices start at 29,900 Euros.